Her career has taken her round the world but popular Chinese folk singer Song Zuying’s latest tour has taken her to new destinations – very new. The military chanteuse entertained workers on Fiery Cross Reef in the Spratlys in the South China Sea. It is the first stop in a tour of the disputed territory, where China has been reclaiming land and building military facilities on reefs. Photos of the performance reveal multi-story buildings and a large warship. Several Asian countries, including Malaysia, the Philippines and Vietnam, also claim sovereignty over the reefs and islands of the Spratlys. 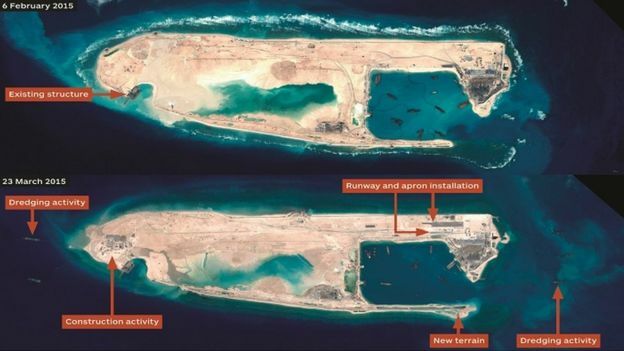 China has been building artificial islands there, saying the structures are for civilian purposes, but neighbouring countries are concerned at their possible military use. The performance by Song and a 50-strong troupe of navy entertainers included magic tricks and songs such as “Ode to the South Sea Defenders”. It took place in front of the People’s Liberation Army’s second biggest ship, using a large naval dock. The BBC’s Stephen McDonell says photos from the performance, which was first revealed on Tuesday by state media, show the extent of the infrastructure being built on Fiery Cross. Images published by the South China Morning Post show large crowds of military personnel enjoying the show on Saturday against a backdrop of the new facilities. China turned the reef into an artificial island through a massive dredging operation, and constructed buildings and an air strip.